This weekend MMA legend Fedor Emelianenko returns to action in the final of Bellator's heavyweight World Grand Prix. Before Saturday night's final with Ryan Bader, check out "The Last Emperor" at his best. This Fedor fight wasn't as straightforward as many of his 38 career wins, as he had to overcome one of the most devastating slams ever seen in mixed martial arts before mounting an improbable comeback to claim victory. American wrestler Kevin Randleman conceded height to Emelianenko, but he his powerful frame was perfect for his wrestling skillset and, after locking his arms around the Russian's waist, Randleman sent his opponent on a spectacular ride that ended with his neck being spiked into the canvas. Most fighters would have been finished by the move, but somehow Fedor rallied before eventually grabbing Randleman's arm and applying a Kimura shoulder lock to force the tap and complete a memorable win. 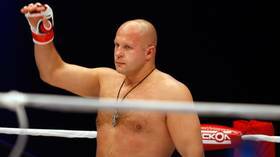 Fedor is a sizable man, but when he lined up against towering South Korean kickboxer Hong Man Choi on New Year's Eve, 2007, he looked like a small child. But that had little effect on the outcome as the Russian used his wrestling and submission skills to drag his huge opponent to the mat, where he locked up an armbar and forced the big man to tap. It was a real David versus Goliath moment, and once again, the shorter man prevailed. 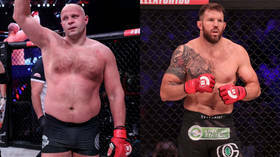 The matchup between former PRIDE heavyweight champion Fedor and former UFC heavyweight champion Andrei Arlovski captured the imagination of MMA fans around the world as they faced off in short-lived MMA promotion Affliction's second big event, "Day of Reckoning". Arlovski actually started the better of the two, and appeared to be getting the upper hand in the striking exchanges. That success lulled Arlovski into a false sense of security, and Fedor struck. After a nice combination, followed by a push kick, sent "The Last Emperor" back against the ropes, Arlovski opted to throw a spectacular flying knee to catch the Russian as he bounced back off the ropes. 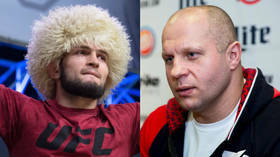 But Fedor saw it coming and connected with a colossal right hand that knocked out "The Pitbull" in mid-air for one of the most spectacular KOs of Emelianenko's career. For a while, American Brett Rogers was one of the rising stars of Strikeforce's heavyweight division. Rogers had built a perfect 10-0 record, with each and every win coming inside the distance, with stoppages due to his heavy-handed strikes. And when the pair met in November 2009, the big American chose to stand toe to toe with the legendary Russian in an attempt to repeat the trick that had given him victory in each of his previous 10 bouts. 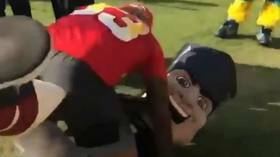 It turned out to be a very bad idea. One shot from Fedor's cannon of a right hand was all it took to send Rogers crashing to the canvas, as "The Last Emperor" handed Rogers his first defeat in spectacular fashion. 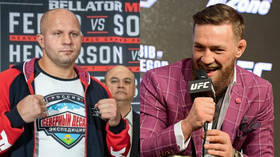 Fedor's most recent appearance saw him claim an easy win over American former UFC veteran Chael Sonnen at Bellator 208. After initially rocking Sonnen with a big right hand, Emelianenko ended up in a mat scramble with the American wrestler. 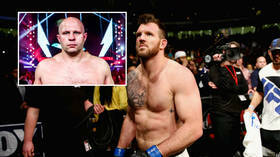 And, after Sonnen tried an ill-advised move to roll out of danger, Fedor pounced and unloaded a barrage of ground and pound that forced the stoppage and sent "The Last Emperor" through to the final of the Bellator Heavyweight World Grand Prix, where he will face former current Bellator light-heavyweight champion Ryan "Darth" Bader for the vacant Bellator heavyweight title. Here's a great compilation of classic moments and incredible finishes from Emelianenko's incredible 19-year mixed martial arts career.